A mating pair of Boophis lilianae, a Data Deficient species of tree frog from eastern Madagascar. This week saw the publication of a paper by Javier Nori and Rafael Loyola in the Open Access journal PLoS One, entitled “On the Worrying Fate of Data Deficient Amphibians” (read the article here). The goal of the paper was to discuss the precarious position of amphibians assessed as Data Deficient (DD) on the IUCN Red list. The study was simple: they downloaded the full database of DD amphibians from the IUCN Red List, together with their distribution polygons, and cross-referenced this against a database of protected areas (also by the IUCN, available here). This again was cross-referenced with country development and policy indices. They then were able to calculate some statistics about the percentage overlap of protected areas and distribution of these amphibians, and thereby draw some conclusions on the ‘threats’ DD amphibians are facing, on the whole. Those familiar with the IUCN Red List will, I hope, have realised the intrinsic flaw in their paper by now. But for those who have not yet caught it, let me explain a little about the IUCN Categories, and what it means to be DD. The IUCN Red List has eight categories: Least Concern, Near Threatened, Vulnerable, Endangered, Critically Endangered, Extinct in the Wild, Extinct, and Data Deficient. A ninth, relatively unpublicised, and far more sinister status is Not Assessed or not even registered in the database—such species face a far worse fate than their DD counterparts, and I will get back to them later. The full details on these categories are available here for interested readers, but for the most part, what each category means is in the name. There are very thorough guidelines on how and when to give each category. These are given sometimes in a subjective way that has received its fair share of criticism, but on the whole they are sufficient to keep things in check. there is inadequate information to make a direct, or indirect, assessment of its risk of extinction based on its distribution and/or population status. A taxon in this category may be well studied, and its biology well known, but appropriate data on abundance and/or distribution are lacking. Data Deficient is therefore not a category of threat. Listing of taxa in this category indicates that more information is required and acknowledges the possibility that future research will show that threatened classification is appropriate. It is important to make positive use of whatever data are available. In many cases great care should be exercised in choosing between DD and a threatened status. If the range of a taxon is suspected to be relatively circumscribed, and a considerable period of time has elapsed since the last record of the taxon, threatened status may well be justified. I have refrained from paraphrasing because I think it important for the reader to a have a thorough understanding of what it means to be classified as DD. Now do you see the flaw? Data Deficiency is often due to a lack of complete data on the distribution of an animal. And yet Nori and Loyola have taken the distributions of DD species, however incomplete, to investigate their overlap with protected areas, and gloss over the meaning of the category altogether. Gephyromantis tschenki is a Data Deficient species that is abundant in Ranomafana National Park. More than half of the investigated species had less than 1% of their distribution outside of a protected area. But that is hardly a surprising piece of information when many DD species are known only from singleton observations. How much can be said of the distribution of a species by a single point observation? This often suffices for the description of the species (distinction can be recognised from just one specimen, especially with genetics in the mix), but beyond that, scientists typically prefer not to extrapolate. The possible range of the new species is impossible to guess from one locality of observation, and so the species goes onto the List as DD. On the other hand, those species for which the ranges are known are usually listed as a ranking other than DD; with a decent distribution map, we can quantify the distribution of risk to a species, even if we don’t know its abundances or distribution within that area. That allows us to assign it a status under at least criterion B1 of the List: geographic range in the form of extent of occurrence. Thus, the entire premise of calculating how much of the range of DD species overlaps with currently protected areas is, by its very nature, using incomplete data to draw conclusions on threat. Anodonthyla jeanbai is a small frog species closely related to and almost indistinguishable from A. boulengeri, described just five years ago from the humid forests of Andohahela National Park in southeastern Madagascar. It is currently listed as DD in the IUCN Red List. Anodonthyla jeanbai. Photo by Miguel Vences et al. 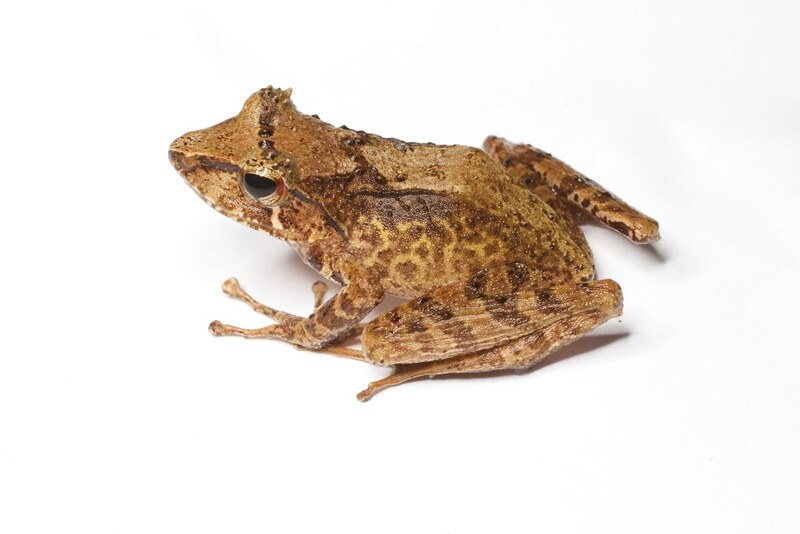 it is known from a single location: “The frog is known from Andohahela National Park, southeast Madagascar, where it has been recorded from a single site at 1,548 m asl”. its range is practically impossible to establish: “It is … impossible to establish with certainty which historical records of A. boulengeri refer instead to this recently-diagnosed species”. 100% of the distribution of this species is within a National Park. But in all likelihood, this species is found in areas outside of Andohahela, and, while that might include other protected areas, it may also include large tracts of unprotected forest. The threats it faces are largely the same as those facing other amphibians in Madagascar, but specifically are not known. There is so much about it that we just don’t know. Boophis liami. Photo by Miguel Vences & Frank Glaw, from the CalPhotos database. 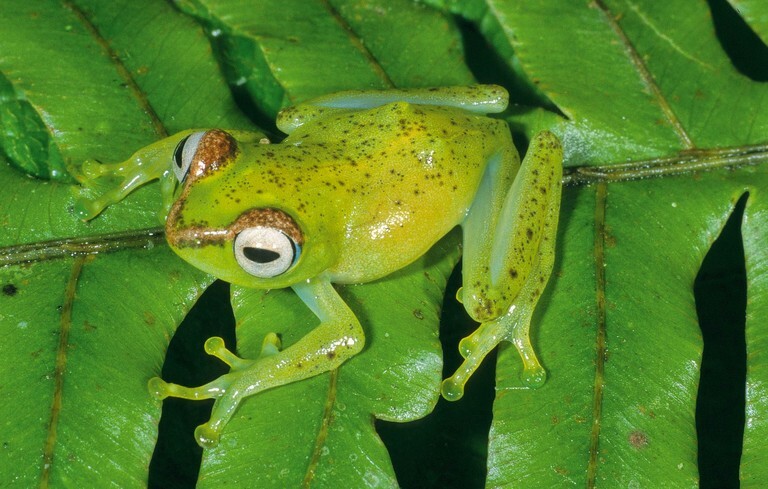 Boophis liami is a distinctive species, both by its morphology/colouration and its call. But it is nonetheless assessed as DD. This species is known from a few locations, but none of them are included in any protected areas. A reliable extrapolation of its range from this limited information is not possible. While it may occur in the protected areas of Analamazaotra, Andasibe, and Mantadia, it has not been found there, and those are some of the best studied parts of Madagascar. Both of these species are listed as DD because, as you would expect, the data are insufficient for a more threatened listing. In both cases, it is because their ranges cannot be reliably estimated, in one case because identifying the species is hard, and in the other because it has only been found in a small area that may not represent its full distribution. They do not qualify for threatened category listings, because without reliable distribution information their population size and its reduction cannot be estimated (Criteria A, C, & D), their geographic range cannot be estimated (Criterion B), the decline in the quality of their full area of occupancy cannot be estimated (Criterion D2 and subcriteria of A and B), and no quantitative analysis of extinction possibility is possible (Category E). Data Deficient it is! In the opening of their abstract, Nori and Loyola state “The ‘Data Deficient’ (DD) category of the IUCN Red List assembles species that cannot be placed in another category due to insufficient information”. They then say “this process generates uncertainty about whether these species are safe or actually in danger.” This is a non-sequitur. Listing species as DD does not generate uncertainty, but is a consequence of uncertainty! Anyone who has worked with the IUCN Red List guidelines to assess species should know that. Moreover, caution must be urged. While it is true that expanding protected areas, as Nori and Loyola recommend, will not harm the future of any species, another apparent recommendation of their paper is that the DD category should be avoided in favour of threat categories, even when the data are insufficient for that purpose. The stance of the IUCN almost reinforces this, as they recommend that the best possible ranking should be applied, in line with data when possible, but also based on reasonable extrapolation by experts. Assessors are encouraged to avoid DD whenever we can come up with a category that fits even incomplete data, in reflection, no doubt, of the fact that they already know that DD is a dangerous assessment to give a species. But we prefer to err on the side of caution. DD species receive that classification when they really deserve it: when we cannot reliably estimate their distributions, or the threats they face. It is true, however, that DD species are threatened; that they are often omitted from conservation assessments because they remain points of uncertainty, even when we know that they are threatened, just not how extremely (although in these cases the species should no longer be listed as DD but the most realistic threatened category!). It is true, also, that DD species deserve special consideration in conservation planning. However, that consideration should primarily be in accumulating relevant data, and not in saying ‘this area has lots of DD species and is therefore in need of protection’; a DD species can, in equal likelihood, move from DD to either Least Concern or Critically Endangered—it says nothing of the threat level of that species. Only in moving species out of DD and into a category of threat are we able to inform conservation decisions based on them. Finally, for a paper focussing on the plight of the unknown, Nori and Loyola neatly gloss over the most ignored species of all (ironic in the extreme): Not Assessed (NA), and not even entered. There are, in general, two types of species that are not assessed by the IUCN: (1) those that are listed but not assessed, either because they were missed by large-scale assessments or are too new to have been included in them; and (2) ‘dark’ species—those that are not even listed. Usually a dark species not included in the IUCN Red List is included in the Catalogue of Life (I can’t think of any frog examples right now, but Pelomedusa subrufa is a turtle that makes a good example). But in some cases, species are really dark: not listed on the IUCN Red list or in the Catalogue of Life. Usually these are brand new species (e.g. Rhombophryne vaventy, described by my colleagues and me in 2014), but occasionally good, established species are just missing from both databases. These NA and not entered species, while much less common than DD species, run the risk of being totally ignored. Their fate is much more sinister than those of DD animals, and therefore ignoring them is just as bad, if not worse, than ignoring the DD species. In updating the Catalogue of Life and providing even basic assessments for all those unassessed/unlisted species, the conservation of these species can be made possible. Without it, they remain in the dark, and relegated to their fate without conservation intervention. Nori and Loyola have missed the point of listing species as Data Deficient, and as a consequence their analysis is next to useless; when we do not know the distribution of a species, quantification of its distribution overlap with protected areas is moot. Data deficient species are indeed neglected, but priority needs to be placed on improving our knowledge of them, and not wasting effort by establishing protected areas willy-nilly without proper data. And while DD species are indeed liable to being relegated to an unknown fate, their fate is still far more determined and positive than the unfortunate species that are not yet assessed or not yet listed in the Catalogue of Life. Emphasis must therefore be placed not just on improving our knowledge of DD species and protection in countries with high diversity and relatively low levels of conservation, but also on maintaining, updating, and improving the IUCN Red List itself. No party has more influence on the fates of species than the IUCN, and transparency and accuracy are therefore of tantamount importance for their database to continue to serve its purpose: informing conservation decisions and actions. IUCN. 2012. IUCN Red List Categories and Criteria: Version 3.1. IUCN, Gland, Switzerland and Cambridge, UK.